The mitochondrial genome of the Octocorallia has several characteristics atypical for metazoans, including a novel gene suggested to function in DNA repair. This mtMutS gene is favored for octocoral molecular systematics, due to its high information content. Several hypotheses concerning the origins of mtMutS have been proposed, and remain equivocal, although current weight of support is for a horizontal gene transfer from either an epsilonproteobacterium or a large DNA virus. Here we present new and compelling evidence on the evolutionary origin of mtMutS, and provide the very first data on its activity, functional capacity and stability within the octocoral mitochondrial genome. The mtMutS gene has the expected conserved amino acids, protein domains and predicted tertiary protein structure. Phylogenetic analysis indicates that mtMutS is not a member of the MSH family and therefore not of eukaryotic origin. MtMutS clusters closely with representatives of the MutS7 lineage; further support for this relationship derives from the sharing of a C-terminal endonuclease domain that confers a self-contained mismatch repair function. Gene expression analyses confirm that mtMutS is actively transcribed in octocorals. Rates of mitochondrial gene evolution in mtMutS-containing octocorals are lower than in their hexacoral sister-group, which lacks the gene, although paradoxically the mtMutS gene itself has higher rates of mutation than other octocoral mitochondrial genes. The octocoral mtMutS gene is active and codes for a protein with all the necessary components for DNA mismatch repair. A lower rate of mitochondrial evolution, and the presence of a nicking endonuclease domain, both indirectly support a theory of self-sufficient DNA mismatch repair within the octocoral mitochondrion. The ancestral affinity of mtMutS to non-eukaryotic MutS7 provides compelling support for an origin by horizontal gene transfer. The immediate vector of transmission into octocorals can be attributed to either an epsilonproteobacterium in an endosymbiotic association or to a viral infection, although DNA viruses are not currently known to infect both bacteria and eukaryotes, nor mitochondria in particular. In consolidating the first known case of HGT into an animal mitochondrial genome, these findings suggest the need for reconsideration of the means by which metazoan mitochondrial genomes evolve. Animal mitochondrial genomes are generally conserved in structure, approximate size and gene content. The circular genome of the so-called higher metazoans typically encodes 13 proteins, 22 transfer RNAs and two ribosomal RNAs, while lacking introns [1, 2]. Variation in genome size usually derives only from length variation in the single large non-coding region, so that most mitochondrial genomes range in size from 14 to 17 kb [1, 2]. The phylum Cnidaria, however, provides many interesting and diverse exceptions to this pattern. For example, medusozoans (jellyfish and hydroids; Classes Cubozoa, Scyphozoa, Staurozoa and Hydrozoa) are unique among animals in having a linearized mitochondrial DNA (mtDNA) [3, 4]. Hexacorals (Anthozoa: Hexacorallia) are unique in that their mitochondrial COI and ND5 genes contain introns, and anthozoan mitochondrial genomes on the whole are known to contain a greatly reduced complement of transfer RNA genes (only 1 or 2 tRNAs) [5–9]. Among the octocorals (Anthozoa: Octocorallia), the mitochondrial genome is known to have undergone inversion and reorganization at least three times [10, 11], including twice within a single family . These changes in octocoral gene order appear to have resulted from intramitochondrial recombination , which itself was believed to be unlikely in animals until its discovery in 1997 . As more mitochondrial genome data become available for cnidarians, and for the Octocorallia in particular, it seems that fewer generalizations of mitochondrial structure and evolution seem applicable to these basal metazoans. Indeed, when the first complete octocoral mitochondrial genomes were sequenced in 1995, another surprise was revealed. The mtDNA of Renilla kolikeri and Sarcophyton glaucum (Anthozoa: Octocorallia) [5, 13] was observed to contain the standard anthozoan complement of oxidative metabolic genes - 13 protein-coding genes, two rRNAs and a single tRNA - but both genomes also contained an unexpected open reading frame (ORF) [5, 14, 15]. Almost 16% of the mtDNA (2949/18453 bp) was occupied by a novel ORF that to this day has not been found in any mitochondrial genome outside of the Octocorallia . Based on 19.7% similarity of the translated sequence to the yeast nuclear Mutation Suppressor Homolog 1 (MSH1) gene, it was suggested that the novel ORF might be active in DNA mismatch repair (MMR) and thus it was first termed 'mtMSH' as a mitochondrial homolog of the eukaryotic MSH family . Alternative names have since been used for this octocoral gene to infer relationship specifically to the MSH1 family ("msh1" [16, 17]) or to encompass broad taxonomic ranges ("mtMutS" ), including MMR genes from both prokaryotes (MutS) and eukaryotes (MSH). We hereafter preferentially use the name 'mtMutS' to refer to the octocoral mitochondrial ORF, since it makes the fewest a priori assumptions of homology to either eukaryotic MSH or prokaryotic MutS MMR gene families, specifically. Paradoxically, while MutS and MSH function in reducing error rates in DNA replication in eubacteria and eukaryotes, respectively , mtMutS itself possesses the highest level of systematically-informative variation amongst any protein-coding mitochondrial gene examined to date within octocorals . As such, it has played a central role in molecular systematic efforts to revise the taxonomic classification of the Octocorallia. Its utility in phylogenetics was first demonstrated in a species-level analysis  and has subsequently been extended to more comprehensive studies of octocoral genera  and subfamilies . Revisionary systematics and the classification of newly described species have also used sequences of mtMutS, either alone  or in combination with nuclear [23, 24] or other mitochondrial [25, 26] sequences. Despite being rapidly embraced as a phylogenetic tool, however, mtMutS is the only animal mitochondrial gene for which both functionality and origin remain equivocal. The observation that the mtMutS gene is present in all octocorals , yet absent from all examined members of the hexacoral sister clade [7, 8] has been instrumental in the formulation of numerous theories regarding its origin (Figure 1). Since all known eukaryotic MSH genes are found in the nucleus, it was first postulated that the presence of an MSH-like gene in the octocoral mitochondrial genome most likely resulted from gene transfer from the octocoral nucleus (Figure 1A) ; this event would have occurred in the common octocorallian ancestor after its divergence from hexacorals. It was further hypothesized that, as a homolog of the MSH1 gene , mtMutS would likely play a role in stabilizing mtDNA [27, 28]. This latter hypothesis is indirectly supported by observations of low levels of DNA sequence variation among other mitochondrial genes commonly used for octocoral population genetics and barcoding efforts . However, although gene transfer from the mitochondrion to the nucleus is well-documented, transfer in the opposite direction, such as that initially proposed for mtMutS , has never been confirmed . Different interpretations of the relationship of mtMutS to MSH1 suggested that the eukaryotic MSH family originated from a nuclear MSH1 ancestor, which was itself transferred from the genome of the endosymbiont precursor of the mitochondrion (Figure 1B) . Under this scenario, the presence of mtMutS in the octocoral mitochondrion represents a relict intermediate between the cellular internalization of bacterial MutS and nuclear eukaryotic MSH. However, with more comprehensive taxonomic sampling, the phylogenetic position of mtMutS relative to MSH1 changes, further diminishing the likelihood it represents a nuclear-mitochondrial transfer event in either direction. A broad-scale study including representative sequences of six eukaryotic MSH families and two bacterial MutS lineages placed mtMutS not as a close relative of MSH genes, but instead at the base of the MutS2 family, which contains prokaryotic and plant MutS genes with unknown functions [30, 31]. Hypotheses of mtMutS origins. Three previously-proposed hypotheses concerning the proximate origins of octocoral mtMutS. 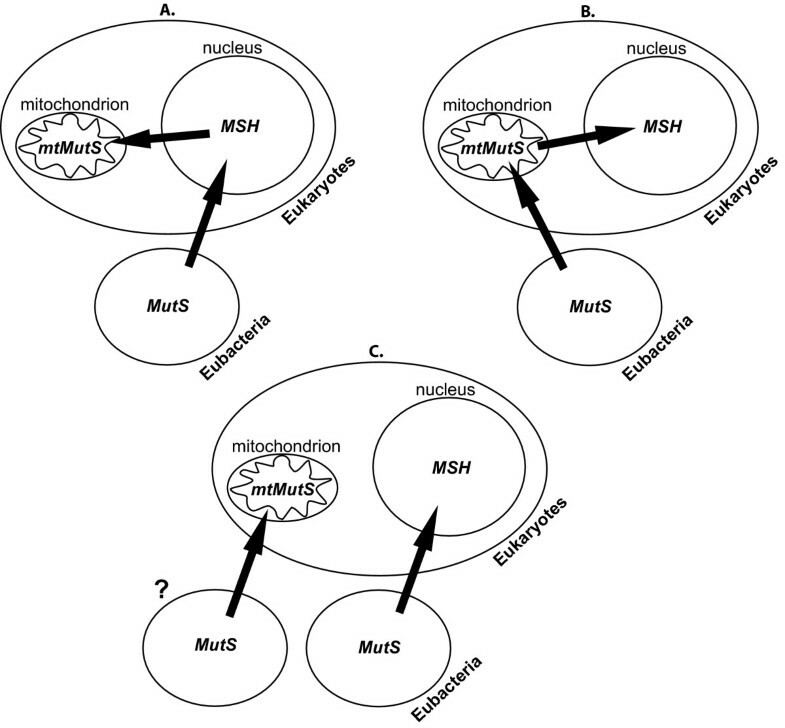 (A) mtMutS originated as a nuclear MSH gene and was subsequently transferred to the mitochondrial genome in octocorals ; (B) mtMutS entered the ancestral eukaryotic cell via endosymbiosis of the mitochondrion-like bacterial ancestor, and was subsequently transferred to the nucleus as MSH and lost from the mitochondrion of all other eukaryotes ; (C) Although both involved a bacterial MutS precursor, mtMutS was acquired by the ancestral octocoral mitochondrion independent of the means by which eukaryotic nuclei acquired MSH . A more recent analysis proposed the closest relative of the octocoral mtMutS to be the MutS sequence from the Acanthamoeba polyphaga nucleocytoplasmic large DNA virus (NCLDV or 'girus'), closely followed by MutS sequences from epsilonproteobacteria . Although no other eukaryotic sequences were included in the analysis, the high level of identity between MutS from the NCLDV and mtMutS (25%), and the presence of a C-terminal HNH endonuclease domain in both, were taken as evidence of common ancestry. This raised the hypothesis that octocorals might have acquired mtMutS via horizontal gene transfer (HGT) from a NCLDV ancestor into the common ancestor of Octocorallia (Figure 1C). An HGT origin of mtMutS is further supported by the most recent and most comprehensive analysis of both MSH and MutS evolution, which included five more NCLDV sequences . 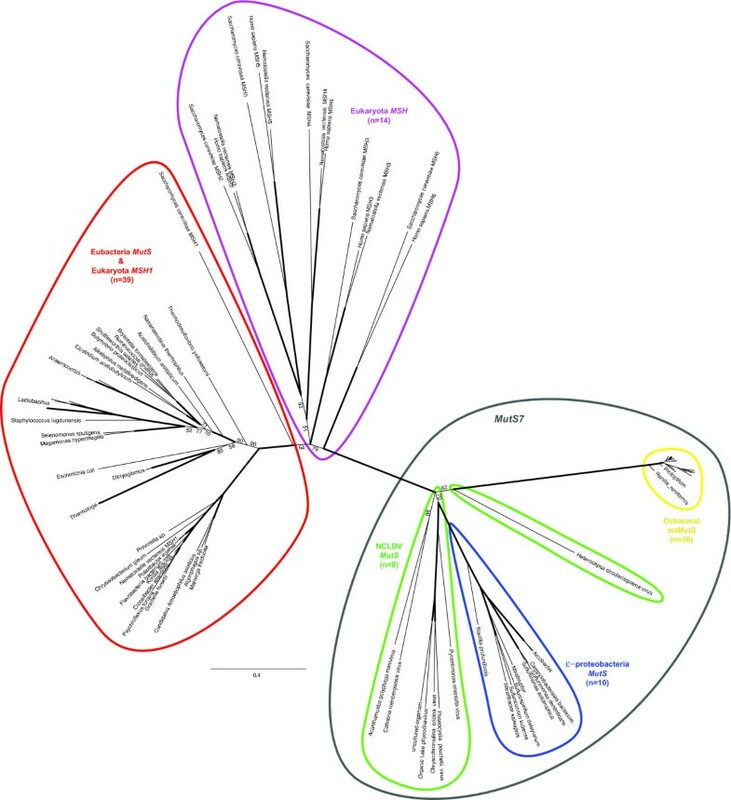 This study provided very strong support for the lineage containing octocoral, epsilonproteobacterial and viral MutS sequences, but was unable to discriminate between the bacterial or the viral lineage as the sister group to mtMutS . Thus the most recent common ancestor to mtMutS remains unknown, although it appears almost certain to be either viral or bacterial - not eukaryotic - in origin. Here we provide further tests of the HGT hypothesis of origin by examining the homology, diversification and evolutionary patterns of the mtMutS gene from multiple octocorals. First, we reconstruct MutS phylogenies using all conserved sections of the gene, rather than only the single domain used previously , thus providing more robust support for the HGT origin. Horizontal gene transfer of a mtMutS precursor from a non-metazoan donor in turn raises multiple questions pertaining to the acquisition, function and evolution of the octocoral gene. In particular, evolutionary theory predicts that the successful integration of HGT- acquired genes into a host genome requires both gene activity and gene longevity . Second, in addressing these predictions, we ask whether the octocoral mtMutS gene is active, and how it has diversified over evolutionary timescales within the foreign host genome . In combination, these analyses significantly expand our understanding of a novel gene that has persisted within octocorals since their most recent common ancestor. PSI-BLAST returned a set of epsilonproteobacteria and nucleocytoplasmic large double-stranded DNA virus (NCLDV) MutS hits as best matches to complete, translated octocoral mtMutS sequences present in GenBank. Both Bayesian (Figure 2) and maximum parsimony (not shown) phylogenetic analysis of an alignment of mtMutS with MutS and eukaryotic MSH representatives (Additional file 1) produced an unrooted tree with strong support for the major MSH and MutS lineages. All octocoral mtMutS sequences were monophyletic (100% posterior probability support; Figure 2, yellow oval), with a basal node connected to the remainder of the tree by a long uninterrupted branch. One of the paraphyletic NCLDV MutS sequences, for the Heterocapsa circularisquama virus, (Figure 2, green oval) formed the sister group to octocorals, although posterior probability support for this placement was a low 62%. The next most probable alternative arrangements of both the Acanthamoeba polyphaga virus and Cafeteria roenbergensis virus or just the A. polyphaga virus MutS lineages as sister to mtMutS received 20.6% and 12.6% support, respectively. MtMutS as sister to a clade of all NCLDV viruses and epsilonproteobacteria, or to a clade of just the epsilonproteobacteria, received less than 5% support (data not shown). A clade of octocoral mtMutS, epsilonproteobacteria MutS and viral MutS received 100% support, indicating the exact sister group of octocorals remains equivocal but contains viral and possibly bacterial lineages with high confidence. Bayesian phylogenetic tree of mtMutS, MutS and MSH gene families. The majority-rule consensus unrooted tree of four runs of 107 MCMC generations with samples drawn every 1000 generations and 36 generations discarded as burn-in. Branches in bold had >95% support while other branches are labelled with lower posterior probabilities. Maximum parsimony analysis produced an unrooted tree with similar general topology (not shown). Coloured ovals delineate the major taxonomic groups or gene families. Taxon sample sizes are given in parentheses for each circled clade. A lack of monophyly between mtMutS and any MSH family, combined with the phylogenetic arrangement of mtMutS within the MutS7 lineage (Figure 2, grey oval) provides further support to a hypothesis of non-eukaryotic origin of mtMutS in the most recent common ancestor of extant octocorals. The sister organism(s) from which the mtMutS precursor was obtained was not identified with confidence in the phylogeny, but the placement of mtMutS within MutS7 strongly supports a hypothesis of horizontal gene transfer. Comparisons of translated octocoral mtMutS sequences with bacterial MutS and eukaryotic MSH genes identified conserved residues consistent with MutS-protein functional sites in all octocoral sequences (Figure 3). An invariant phenylalanine is located at position 44, consistent with a MutS Domain I DNA mismatch detection site [36, 37]. Positions 1305 to 1313 contain a SVNGAGKST motif consistent with a Walker A loop of a MutS ATPase domain (Domain V) [36–38]. Walker B- (hhhhD/E; positions 1348-1352), Q- (glutamine; position 1326), H- (histidine; position 1425) and D-loop (asparagine; position 1387) motifs of a MutS Domain V are also invariant among all octocoral sequences. Conservation of active residues among mtMutS, MutS and MSH amino acid sequences. An amino acid alignment of a reduced set of taxa included in the phylogenetic analysis, illustrating conserved positions or motifs (black boxes) known to function in MutS/MSH-mediated MMR or HNH endonuclease activity. Numbers above alignment blocks indicate the position within the alignment, relative to the 5'-end of octocoral sequences. Vertical lines separate the three regions of homology, in order: Domain I, Domain V and the HNH endonuclease domain. Taxa lacking the HNH domain were omitted from the latter alignment. All 30 octocoral mtMutS sequences included in our analysis contain three of the expected 'pfam' domains: a MutS Domain III ('MUTSd'), a MutS ATPase Domain V ('MUTSac') and an HNH endonuclease domain ('HNHc') (Figure 4). A fourth MutS Domain I ('MutS_I') is found in all but three sequences (data not shown). However, a homologous amino acid sequence for Domain I is apparent in all 30 octocoral sequences (Figure 3). There is no evidence of domain shuffling, with all sequences showing a consistent order of Domain I - Domain III - Domain V - HNH endonuclease. We found no evidence of Domains II and IV in any octocoral mtMutS sequence and their presence is likely to be unnecessary for protein activity since they are absent from nearly all MutS families aside from MutS1 [: Figure 2]. A comparison of predicted protein family domains in mtMutS, MutS and MSH amino acid sequences. The results of SMART database queries for an exemplar octocoral mtMutS sequence (GenBank Acc. # AAP92775) vs. the predicted domain organization of the Acanthamoeba polyphaga mimivirus (YP_142713), E. coli (CAQ33065) and yeast (NP_011988). 'Domain I', 'II', 'III' and 'V' refer to MutS/MSH-specific domains; 'HNH' refers to the HNH endonuclease domain. As previously reported for S. glaucum , the HNH endonuclease domain detected by SMART at the C-terminal end of all octocoral mtMutS sequences contains characteristic histidine-histidine-asparagine-histidine (HHNH) amino acids at positions 1676, 1677, 1709 and 1718, respectively (Figure 3). These residues are conserved with HNH-containing MutS sequences found among the epsilon-proteobacteria and NCLDV sequences. HNH domains were not detected by SMART in any other queried MSH or MutS protein sequences, providing further evidence of common ancestry of mtMutS and other MutS7 genes. Protein tertiary structures predicted from all octocoral mtMutS sequences are also consistent with the structure of the known, functional MutS monomer in E. coli (Figure 5), although the presence of a C-terminal HNH endonuclease domain is more similar to the tertiary structure and domain organization we predicted for A. polyphaga mimivirus MutS (Figure 5B). The predicted relative positions of Domain I and Domain III in octocoral sequences support their roles as a mismatch-specific central clamp and a non-specific upper DNA clamp, respectively (see also ). Domain V forms the structural core of mtMutS, with the HNH endonuclease as a C-terminal 'tail'. To our knowledge, these results represent the first report of predictive reconstruction and comparison of mtMutS protein structure in octocorals and support a functional role of mtMutS in DNA mismatch repair. The predicted tertiary protein structure of mtMutS and its similarity to predicted and experimentally determined MutS structures. (A) The predicted monomer structure of the mtMutS protein, as determined by the I-TASSER database. (B) The predicted monomer structure of the HNH-containing Acanthamoeba polyphaga mimiviral MutS protein. (C) The crystal structure of a monomer of MutS from E. coli, as determined by . Colours correspond to the domains identified in Figure 4: Red = Domain I, Blue = Domain III, Yellow = Domain V, Green = HNH endonuclease domain. A 687 bp DNA product was produced by amplification of mtMutS from both gDNA and cDNA using PCR primers specific to the 5'-end of the gene (Domain I) (Figure 6). Controls for both genomic DNA contamination of RNA (cDNA controls lacking reverse transcriptase) and for foreign DNA contamination (no template added) failed to amplify, confirming that cDNA PCR products were of mRNA origin. The sequences of cDNA and gDNA PCR products from Isis hippuris, Nephthya sp. and Sarcophyton ehrenbergi were all confirmed by BLAST as mitochondrial mtMutS sequences. No post-transcriptional modification was detected in comparisons of cDNA and gDNA sequences. These results provide the first evidence that mtMutS is transcribed in a variety of octocorals and that the mRNA is available for translation into a potentially functional protein. 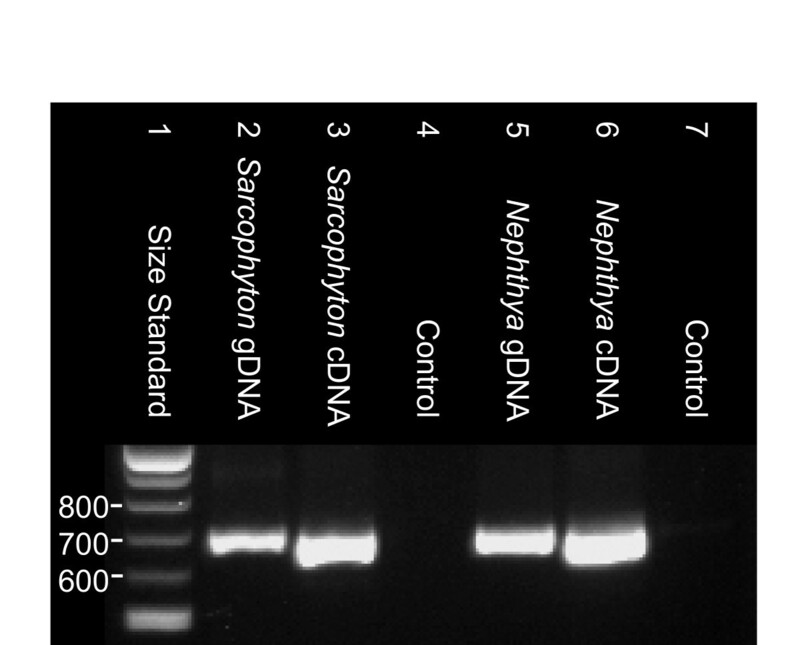 Gel electrophoresis results of PCR amplification of mtMutS from genomic DNA and transcribed mRNA. A 1.5% TBE gel displaying the results of PCR amplification of the 5'-end of the mtMutS gene from genomic mtDNA (lanes 2 & 5) and reverse-transcribed mRNA (lanes 3 & 6). Controls (lanes 4 & 7) of corresponding mRNA samples lacking polymerase in reverse-transcription reactions were included to demonstrate that cDNA PCR products were not of genomic DNA origin. Alignments of 1597 bp in 169 taxa, 3967 bp in 410 taxa and 3426 bp in 509 taxa were generated for octocoral COI, hexacoral COI and octocoral mtMutS mtDNA sequences, respectively, using all available data present in GenBank. Alignments of 1737 bp in 224 taxa and 1871 bp in 145 taxa were generated for hexacoral and octocoral 18S nuclear DNA sequences, respectively. Mann-Whitney U-tests indicated highly-significant differences (p < 0.0001) between the means of pairwise genetic differences in mtDNA sequence comparisons of octocoral mtMutS vs. octocoral COI and octocoral COI vs. hexacoral COI and between nuclear DNA sequence comparisons of octocoral 18S vs. hexacoral 18S. Tests using only taxa with less than 10% missing data in each comparison yielded identical significant results (data not shown), thus the inclusion of taxa with incomplete gene sequences did not alter the results of the full comparisons. 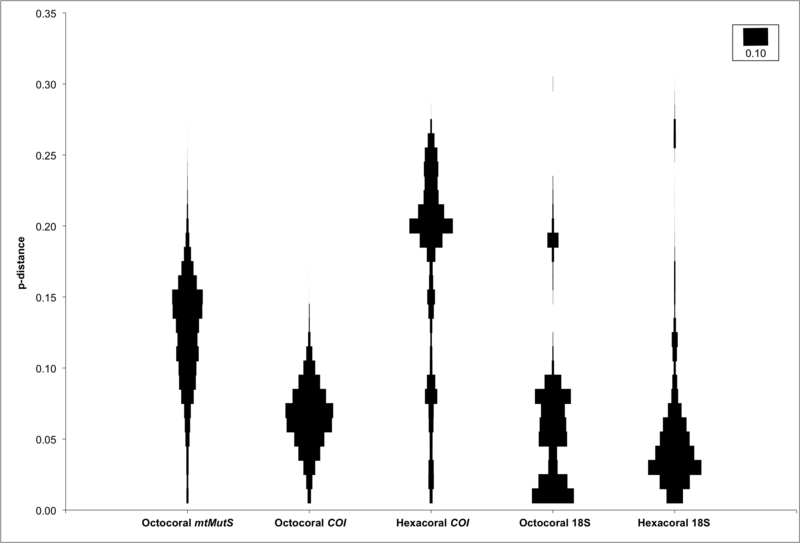 The distances among the octocoral COI sequences display both the smallest range and modal value among mitochondrial datasets, whereas the hexacoral COI sequences display the largest range and the highest modal value (Figure 7). The octocoral mtMutS sequences display both an intermediate range and mode between octocoral COI and hexacoral COI. The hexacoral COI distribution is negatively skewed (Figure 7), with greater distances attributed to inter-ordinal comparisons and, within the Scleractinia, distances between the 'complex' and 'robust' clades  (data not shown). Relative frequencies of pairwise genetic distances among octocoral and hexacoral mitochondrial and nuclear DNA sequences. A comparison of the distributions of uncorrected pairwise distances of DNA alignments of 509 sequences of octocoral mtMutS, 169 sequences of octocoral COI, 410 sequences of hexacoral COI, 224 sequences of hexacoral 18S and 145 sequences of octocoral 18S. Widths of each row correspond to the relative frequency of each category of pairwise distance. The scale bar (inset) indicates a relative frequency of 10%. Among the nuclear 18S sequence comparisons, octocorals display a significantly higher mean pairwise distance than hexacorals (p < 0.0001), opposite to the pattern observed for the mitochondrial genome. Both octocoral and hexacoral 18S distributions were positively skewed and displayed, respectively, the highest and second-highest distances out of all examined datasets. However, both 18S datasets had modal values and the majority of their distributions in a range of distances similar to the distribution of octocoral COI (Figure 7). These patterns indicate an overall reduced rate of evolution of octocoral COI relative to hexacoral COI since the time that they diverged from their last common ancestor. Given the corroboration of previous observations of low divergence levels in other mitochondrial genes [20, 40, 41], we may extrapolate our observation to the mitochondrial genome as a whole. However, the mtMutS gene itself displays significantly higher pairwise distances than COI, although its modal divergence level is still low compared to that observed between inter-ordinal taxa of scleractinians (Figure 7). Furthermore, the results of the 18S comparison indicate that the reduction in rates of octocoral mitochondrial mutation may not extend to the nuclear genome. Octocorals may, conversely, display higher rates of nuclear mutation than hexacorals, as displayed for our 18S comparison (Figure 7). The mitochondrial targeting of MSH1 plus initial observations of sequence similarity between MSH1 and mtMutS formed the basis of early conclusions that the two genes were orthologous . However, this phylogenetic association appears to be artifactual, due to insufficient sequence sampling from prokaryotic sources in these initial studies. The continued expansion of available MutS sequences from an array of prokaryotes allowed a new phylogenetic arrangement for mtMutS - one that placed it in an association with the epsilonproteobacteria and giant double-stranded nucleo-cytoplasmic viruses (NCLDV's or "giruses")  in one of four new MutS lineages, namely MutS7 . Members of the MutS7 lineage are united by Domains I, III and V of MutS plus a C-terminal HNH endonuclease domain. In contrast, MSH1 and other members of its MutS1 lineage contain MutS/MSH domains II and IV and lack an endonuclease domain . Our phylogenetic analysis provides further support for this placement of octocoral mtMutS within MutS7 with high levels of confidence (Figure 2), and provides conclusive evidence that the octocoral mtMutS gene does not share an immediate common ancestor with any eukaryotic MSH family, including MSH1. The exclusion of the HNH domain from our phylogenetic analysis indicates the tree topology is based upon evolution of homologous MutS domains and not on this MutS7 synapomorphy. If mtMutS is active in mitochondrial MMR, this similarity in function with MSH1 would likely be the result of convergent evolution between paralogous genes. For these reasons, the octocoral mitochondrial MutS gene should no longer be referred to as 'msh1', as in the current systematic literature (e.g. [20, 25, 41]), since it carries the connotation of eukaryotic origins. We recommend the adoption of the name mtMutS, after studies which first identified it as a unique mitochondrial MutS gene (this study; [30, 31]). Even more specifically, mtMutS7 could be used to further identify it as a member of the MutS7 HNH endonuclease-containing family . The evidence for a non-eukaryotic origin of mtMutS in octocorals rules out the possibility of either a mitochondrion-to-nucleus  or nucleus-to-mitochondrion  translocation hypothesis in its relationship to MSH families (see Figure 1B,C). This also necessitates a reinterpretation of the origins of MSH in eukaryotes. It has been proposed that the endosymbiotic incorporation of a mitochondrion-like prokaryotic cell brought MutS into the primordial eukaryotic cell (as MSH1), with translocation to the nucleus and a series of gene duplications producing the remaining MSH families . While MSH1 was proposed to be a basal family among all MSHs, evidence for it once existing within the mitochondrial genome was based on apparently artifactual phylogenetic associations with mtMutS. In addition to our findings (Figure 2), more comprehensive MutS/MSH phylogenies [30, 33] also indicate that MSH1/MutS1 is a highly-derived lineage relative to the other eight families of prokaryotic MutS and six families of eukaryotic MSH. Thus, although a prokaryotic origin of MSH is supported by all current phylogenetic hypotheses [18, 30, 33], evidence for an intermediary role of the mitochondrion in this process is lacking. The affinity of a monophyletic octocoral mtMutS lineage to the MutS7 family containing MutS from epsilonproteobacteria and NCLDVs supports the hypothesis of horizontal gene transfer (HGT), as initially suggested  and later evidenced [32, 33]. The presence of the HNH endonuclease domain supports a common ancestry of MutS in these three disparate groups of organisms [32, 33], but the direction and means by which the gene was distributed remain questionable. The MutS7 lineage could have origins either within the basal Eukaryota or the Eubacteria, given that it occupies a clade in-between the MutS1/MSH lineages and the other seven MutS families [: Figure 1]. Within the MutS7 lineage, the branching order of the octocorallian, bacterial and viral MutS lineages can provide clues into the origins of the gene family. Unfortunately, neither the previous comprehensive phylogenetic analysis  nor our current study produced phylogenies with strongly supported topologies for the branching order of MutS from Octocorallia, NCLDVs and epsilonproteobacteria. The octocoral mtMutS and epsilonproteobacterial MutS lineages are both monophyletic with high posterior probability, as is the entire MutS7 lineage, but whether the NCLDV, the epsilonproteobacteria or both are the sister group to octocorallian mtMutS can not yet be determined (Figure 2; [:Figures 1a, S2]). Although less taxonomically-comprehensive for octocorals, a previous study [: Figure 5] provided 89% bootstrap support for A. polyphaga mimiviral MutS as the sister lineage to octocoral mtMutS, with the epsilonproteobacteria forming a basal MutS7 divergence. On this finding, they proposed a scenario whereby mtMutS was transferred from a microbial host into the mitochondrion of the common octocorallian ancestor via a NCLDV vector. Although viruses infecting the mitochondrial genome ('mitoviruses') have been documented, they have so far been limited to single- or double-stranded RNA viruses and are so far only known to infect fungi . Double-stranded DNA viruses, such as the NCLDVs, are not known to infect host mitochondria, thus a mechanism by which a viral MutS could have entered an octocoral mitochondrion is currently lacking. Interestingly, mitochondria are known to migrate to viral assembly sites in infected primate cells [43, 44]. If similar responses occurred in NCLDV-infected cells, it would place the host mitochondrial genome in proximity to viral DNA. At this time, however, it is unknown whether any MutS7-containing NCLDV is capable of infecting an octocorallian cell. Furthermore, although NCLDVs infect a wide range of hosts , none of them are bacterial and no examples exist of any virus that directly infects both prokaryotic and eukaryotic cells. An alternative means for octocorals acquiring mtMutS through HGT may not involve NCLDVs at all. 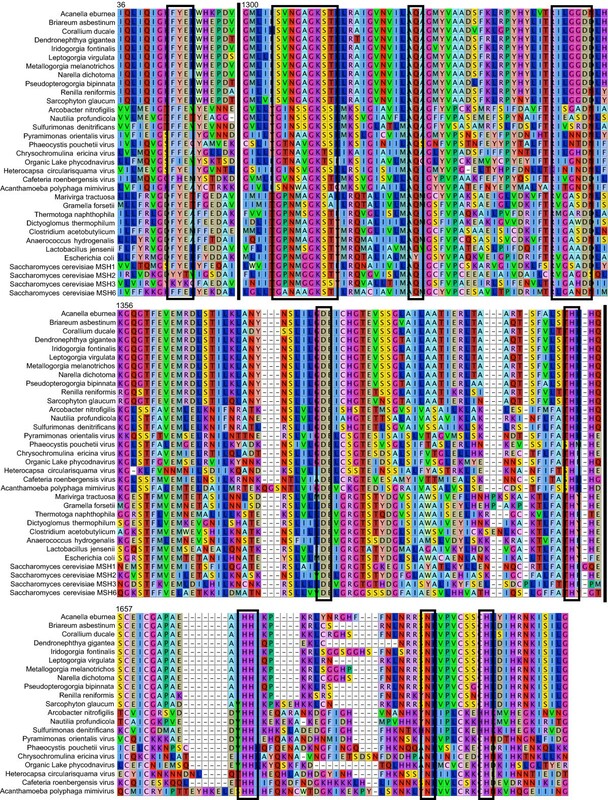 Diverse arrays of bacterial genotypes are known to associate with the surfaces and tissues of marine invertebrates, including anthozoans [45, 46]. These microbial communities can include endosymbionts [47, 48], which may confer advantages to host cells such as the fixation of nitrogen . HGT between bacteria is thought to be common in the marine environment  and has been reported to have occurred multiple times between bacteria and nematodes in terrestrial systems . A similar association between a MutS7-containing bacterium and an octocoral may have been responsible for HGT of mtMutS. Epsilonproteobacteria are common constituents of deep-sea environments [50, 51], which also contain diverse octocoral communities (e.g. ), therefore associations between the two are possible. The fact that such an occurrence has not yet been documented may simply reflect the lack of study of non-pathogenic bacterial associations in octocorals. Evolutionary theory predicts that a successful HGT integration requires that the transferred gene be active in the new host . Our results have demonstrated for the first time that the octocoral mtMutS gene contains all coding necessary for a functional MutS protein. The presence of conserved residues for mismatch recognition in Domain I and ATPase-specific residues in Domain V provide primary evidence for functionality (Figure 3). The presence and conserved order of three MutS protein domains provides secondary evidence (Figure 4) and the conserved conformation model (Figure 5) provides tertiary evidence that mtMutS has the potential to play an active role in the octocoral proteome. Finally, our transcriptional analysis indicates that mtMutS is transcribed and available as mRNA for translation (Figure 6). Successful integration of a horizontally transferred gene into a host genome also requires longevity over evolutionary time . Phylogenetic analyses clearly reveal that the mtMutS gene has persisted in octocorals since at least the last common ancestor of all extant species (Figure 2; see also ). Given the reduction of gene content in the octocoral mitochondrial genome [2, 5] and the frequency of its reorganization through intramitochondrial recombination events , it can be deduced that there is strong selection for the continued presence of mtMutS. Interestingly, no octocoral has been found to lack mtMutS even though the very existence of the hexacoral sister group demonstrates that anthozoans are capable of persisting over geologic time spans without it. Apparently the presence of mtMutS provides a selective advantage in octocorals, but one that is unnecessary for normal anthozoan mitochondrial function. The subcellular target of the mtMutS mRNA, and the role of the gene product, remains unknown. The predicted protein structure, including the presence of a mismatch recognition site in Domain I (Figure 3), suggests a role in DNA mismatch repair (MMR) is highly likely. Our findings indicate a reduced rate of mtDNA evolution in at least one gene in the Octocorallia, relative to its sister group, that does not appear to extend to the nuclear genome (Figure 7). The eukaryotic MSH1 gene, for example, is a nuclear-encoded gene with a protein product that is translocated to the mitochondrion, where it performs MMR [27, 53, 54]. The MSH1 protein is known to form homodimers during mismatch binding in the mitochondrion , but its interaction with other proteins, particularly an endonuclease for strand excision, is unknown. The dimerization of mtMutS has not been examined, but it is possible that the presence of an HNH endonuclease domain could confer self-sufficiency to the protein . The domain is of a type II endonuclease, which is capable of nicking a single target strand such as the erroneous daughter strand in a mismatched DNA heteroduplex. Although prokaryotic MutS1 and eukaryotic MSH2, 3 and 6 MMR systems require one or more other proteins for excision (MutL+MutH and MLH, respectively) , the HNH domain on the C-terminal end of mtMutS could replace their actions, obviating the need for additional MMR components. This self-sufficiency could lend itself to mitochondrial MMR activity since MLH proteins associated with nuclear MMR display no active role in mitochondrial MMR [53, 56] and thus may be incapable of translocating across the organellar bilayer. Regardless of the vector of mtMutS HGT, and of specific function, the gene's presence within the mitochondrial genome of octocorals is remarkable in itself. It adds another example of a metazoan subjected to HGT to a list that already includes nematodes  and molluscs . Unlike these other cases, however, mtMutS represents the only recorded instance of HGT into a metazoan mitochondrion. This necessitates a reconsideration of the mechanisms by which mitochondrial genomes evolve since it allows for the possibility of the introduction of foreign genetic material into a system previously thought to be constrained to inheritance through (typically maternal-) descent. It is also noteworthy that the evolution of mtMutS itself seems unconstrained by the reduced rate of mutation seen in other octocoral mitochondrial genes (Figure 7). We have now initiated studies to isolate nuclear MSH genes from octocorals and compare their ancestral patterns of diversification to mtMutS to determine if this pattern is shared by other MMR genes. We have provided consolidating evidence for a non-eukaryotic origin of mtMutS and have demonstrated the monophyly of this gene among octocorals and other members of the MutS7 lineage. It now seems unequivocal that mtMutS arose once during octocorallian evolution, in the common ancestor of all extant lineages, through a horizontal gene transfer event from either an epsilonproteobacterium or a nucleocytoplasmic large DNA virus. This transfer represents the only instance recorded to date of HGT into a metazoan mitochondrion. The transferred gene appears to have been successfully integrated into the host genome, as evidenced by both its persistence over evolutionary time and its transcriptional activity. The mtMutS protein contains conserved amino acid positions and domains necessary for post-replicative DNA mismatch repair, as well as a unique additional domain that may enable it to function in a self-contained manner. Although mtMutS function remains unknown, we have demonstrated that at least one mitochondrial gene exhibits significantly lower rates of evolution in octocorals compared to hexacorals, providing evidence that mtMutS-mediated MMR may be operating within the octocoral mitochondrial genome. All complete MutS derived amino acid sequences from octocorals (n = 30) were obtained from GenBank http://www.ncbi.nlm.nih.gov/. These sequences were then used in PSI-BLAST searches to obtain the most similar protein matches from non-octocorallian taxa. In addition, representatives of eubacterial MutS and the six eukaryotic MSH families were also downloaded for comparison. Eubacterial MutS sequences included Escherichia coli and bacterial hits to octocoral BLAST searches. All eukaryotic MSH sequences were obtained from Homo sapiens, Saccharomyces cerevisiae and Nematostella vectensis genomic datasets (Additional file 1). The presence and identity of protein family domains ('pfam') within octocoral MutS sequences was inferred from queries in the Simple Modular Architecture Resource Tool (SMART) database of EMBL http://smart.embl-heidelberg.de/. 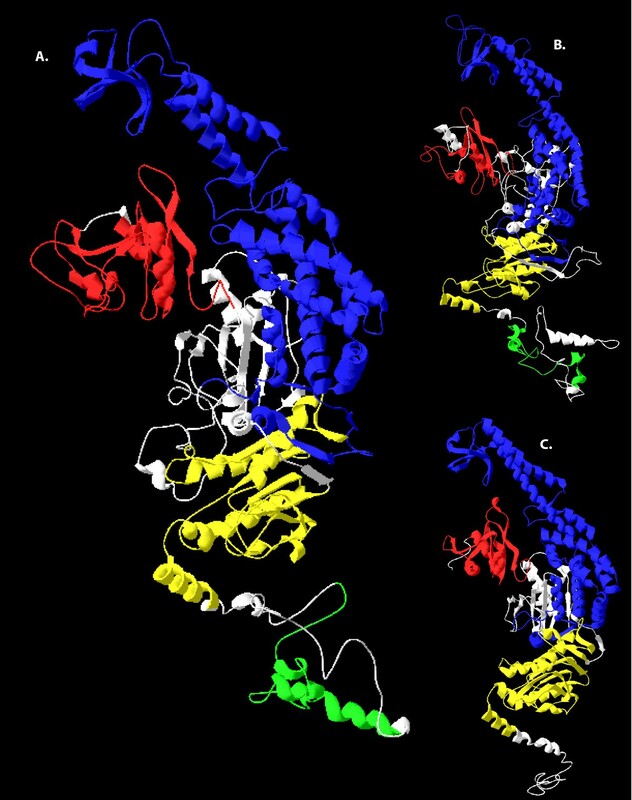 The secondary and tertiary structures of protein sequences were inferred through submission to the I-TASSER server http://zhanglab.ccmb.med.umich.edu/I-TASSER/, which predicts structure and function through comparison to databases of known protein function. The results were compared to predicted structures of the most-similar non-octocorallian BLAST results as well as to the known structure of E. coli MutS, as determined by Lamers et al. . In particular, conserved functional residues in each domain were compared for their location within predicted domains and tertiary structures. All amino acid sequences were aligned with the E-INS-I method in MAFFT , using the BLOSUM45 scoring matrix. The output was manually adjusted in MacClade 4.08 (Sinauer Assoc.) using the SMART pfam results to ensure homologous domains were correctly matched in the final alignment. Conserved functional residues or motifs of residues in each domain were also used to assist in the manual adjustment, which produced an alignment of 101 taxa and 1819 characters (available on request from the authors). Trimming the amino acid alignment of ambiguously aligned regions resulted in a truncated alignment of 592 characters, with most trimmed regions in Domain I and the interdomain region between Domain I and Domain III. Excluded regions typically contained gaps for all but a minority of taxa, and were thus unlikely to be informative in the phylogenetic analysis. Importantly, the C-terminal HNH domain was trimmed from the final alignment and excluded from subsequent phylogenetic analyses since a homologous domain was not found among the included eubacterial MutS and eukaryotic MSH sequences. MEGA 5.05  was used to calculate maximum parsimony trees and to determine an initial distance correction model for Bayesian phylogenetic analysis. Tree searching used the Close-Neighbor-Interchange method with 1000 initial random trees and a MP search level of three. Clade support within the parsimony tree was calculated using 1000 replicates of nonparametric bootstrapping. The Bayesian analysis was implemented in MrBayes 3.1.2  using four independent MCMC runs, each containing six chains of 107 generations, with two swaps per generation ('nswaps = 2') and trees sampled every 1000 generations. The amino acid distance correction model was adjusted using the 'aamodelpr = mixed' prior in preliminary runs. Burn-in was determined using Tracer 1.5 http://beast.bio.ed.ac.uk/Tracer and the remaining trees were used to construct a 50% majority-rule consensus tree (the 'allcompat' option of 'sumt'). Gene trees obtained by maximum parsimony and Bayesian inference were compared for clade structure and for the determination of the sister taxon to the octocoral mtMutS lineage. Gene expression of mtMutS in octocorals was tested through comparative amplification and sequencing of genomic DNA and reverse-transcribed mRNA. Fresh tissue samples of Isis hippuris, Nephthya sp. and Sarcophyton ehrenbergi were collected from Heron Island Reef, Australia (23.44710°S, 151.91800°E) and were immediately preserved in both 96% ethanol (for DNA extraction) and RNAlater (Sigma-Aldrich Ltd.) and frozen at -80°C (for RNA extraction). Total genomic DNA extraction used a standard 2XCTAB protocol  with a single chloroform extraction. Extraction of total RNA was performed with Trizol (Sigma-Aldrich Ltd.), following the manufacturer's recommended protocol for high-salt precipitation. Total RNA was then treated with 1 μl DNase I (Invitrogen Corp.) prior to reverse-transcription using SuperScriptIII (Invitrogen Corp.) to generate cDNA. Reverse transcriptase-free negative controls were included to check for genomic contamination of total RNA extracts. Octocoral mtMutS in gDNA and cDNA was amplified using 0.22 mM of dNTPs, 3 units of Taq polymerase, 1X Taq Buffer (50 mM KCl, 10 mM Tris-HCl pH 9.0, 1.5 mM MgCl2), 2.9 mM of MgCl2, 0.16 μM of each primer and either 1 μl (cDNA) or 2 μl (gDNA) of template DNA. The forward primer (mtMutS93_Fwd: AGTTCTATGAACTTTGGCATGAG) was designed by the authors to anneal near the 5'-end (Domain I) of the octocoral mtMutS gene and was paired with an existing reverse primer (Mut3458R: TSGAGCAAAAGCCACTCC) . Although both primers were designed for specificity to mtMutS, BLAST searches were conducted on each to ensure nuclear MSH or other heterologous loci would not be amplified. Reactions were performed under thermocycler conditions of 94°C for 2 min followed by 35 cycles of 94°C for 60 s, 58°C for 60 s and 72°C for 60 s, with a final extension of 5 minutes at 72°C. Template-free negative PCR controls were included in all reactions to ensure observed products were of octocoral origin. The size of amplified products from gDNA and cDNA were compared on a 1% agarose gel and RT-PCR controls were included to ensure cDNA amplicons were of mRNA origin. Bands of expected size were excised from the gel and dissolved in 4 volumes of 6 M NaI at 55°C for 5 minutes, followed by the addition of 15 μl hydrated silica suspension. The solution was incubated for a further 10 minutes, spun at maximum speed for 30 s and the supernatant was discarded. Pellets were resuspended in 500 μl of buffer (50 mM NaCl, 10 mM Tris-HCl pH 7.5, 2.5 mM EDTA, 50% ethanol), incubated at 55°C for 5 min, spun down and the supernatant was discarded again. The pellets were washed a second time and the pellets were dried prior to resuspension in 20 μl water. Direct cycle sequencing of these gel-purified PCR products was performed in both forward and reverse directions in 10 μl volumes using 18-30 ng of template DNA, 8 nmol of primer, 1 μl of BigDye Terminator Ready Reaction Mix (Applied Biosystems) and 1.5 μl of buffer. Cycling was performed at 96°C for 2 minutes, followed by 30 cycles of 96°C for 10 s, 50°C for 5 s and 60°C for 4 minutes. Products were cleaned, precipitated and submitted for capillary sequencing at the Australian Genome Research Facility following their guidelines http://www.agrf.org.au/. Sequences for each colony were assembled and edited in CodonCode Aligner 3.7.1.1 (CodonCode Corp.) and were submitted for BLASTn searches to ensure they were octocoral in origin and not due to contamination. Corresponding mtMutS sequences of gDNA and cDNA for each amplicon were then compared for identity and were deposited into GenBank as accession numbers JN383337-JN383342. All existing octocoral mtMutS and anthozoan cytochrome oxidase subunit I (COI) and small ribosomal subunit (18S) DNA sequences over 200 bp in length were obtained from GenBank. The sets of sequences for mtMutS and COI were aligned according to their amino acid translation frame in MacClade and all three datasets were trimmed to exclude intergenic regions, introns (present in hexacoral COI, including actiniarians [AF000023], scleractinians [FJ345452, FJ345449] and antipatharians [FJ597643]) and any ambiguous sections of alignment. Incomplete 5' and 3' ends were coded as missing data ("?") for sequences not spanning the length of the genes. Redundant sets of sequences were each collapsed into a single, multi-species taxon and the resulting matrix was used to calculate uncorrected pairwise distances among octocoral mtMutS sequences, octocoral COI sequences, hexacoral COI sequences, octocoral 18S sequences and hexacoral 18S sequences in MEGA. Mann-Whitney U-tests were used to test for significant differences in the mean pairwise differences between octocoral mtMutS and octocoral COI, between octocoral COI and hexacoral COI and between octocoral 18S and hexacoral 18S. We acknowledge the University of Queensland's Heron Island Research Station for facilitating collection of octocorals from Heron Island Reef, and to the Great Barrier Reef Marine Park Authority for providing a permit for collection of octocoral material. We greatly appreciate the helpful discussion and insightful comments provided by members of the joint Degnan Lab, and by two anonymous reviewers. This work was made possible by generous funding support from the Deep Ocean Australia program and the Australian Research Council to SD. JB and SD together conceived and designed the study. JB conducted the phylogenetic, gene structure, protein structure and gene expression analyses, and drafted the manuscript. SD advised on data analyses and helped to draft the manuscript. Both authors read and approved the final manuscript.